SMSB student-athletes at Georgetown University. Every year, thousands of students go on college tours to Historically Black Colleges and Universities or on football recruiting visits. Not many do both. Sound Mind Sound Body co-founder Curtis Blackwell and a few high school football coaches and volunteers loaded 100 Detroit-area high school football players onto Trinity Transportation charter buses and took them to several HBCUs and other colleges across the east coast. But it was not your average college tour where players tried on jerseys, shook a coach’s hand, and took pictures. The SMSB Football Academy was created in 2004 to increase the number of football student-athletes graduating high school and earning college scholarships in the Metro Detroit community. Every weekend, the student athletes meet at the Mack Athletic Complex to perfect their skills on the gridiron, as well as in the classroom. The classroom portion, in the basement of the dome, consists of tutoring and mentorship, where the student-athletes work on proper introductions, improving their GPAs, ACT prep, and talking to those who walked in their shoes before. The college tour was just a culmination of the work they do on a weekly basis. SMSB student-athletes at the Lincoln Memorial. The student-athletes toured a total of 11 schools on their trip, including several HBCUs such as Howard University, Morehouse College, Clark-Atlanta University, Morgan State, Norfolk State, and many more. 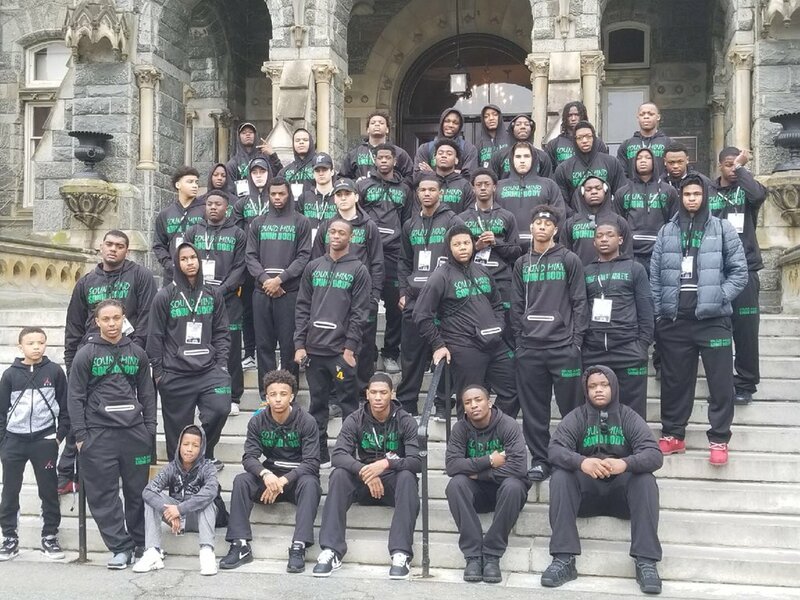 The players received over 70 offers on the trip, many from HBCUs they would have never been in contact with, let alone visit, if it were not for the bus tour. That was the entire purpose of the trip: to expose the players to places they had only heard of and saw on television and social media. Another unique aspect of the college tour was that the student-athletes were also able to learn about their heritage and the people who blazed a trail for them to be able to have the basic human rights many did not have in the past. They have learned about Rev. Dr. Martin Luther King Jr. in the classroom but to actually be able to take a tour of his memorial in Atlanta was a next level experience. They also visited the National Museum of African-American History and Culture in Washington D.C. where they able to see Emmett Till’s casket and Fort Monroe in Virginia, where former slaves settled after the Civil War. Football was the catalyst that brought everyone together for the trip, but the historical aspect really opened they eyes of many players who only experienced what was in their neighborhood surroundings.